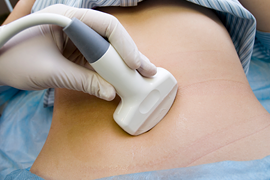 Abdominal Aorta Ultrasound is a painless test we use to view your aorta. This artery runs down the middle of your body and supplies blood to the lower half of your body. By using sound wave technology, there is no pain and little if any discomfort. The sound waves allow us to check your aorta for blockage, narrowed pathway due to plaque, or an aneurysm. In the case of an aneurysm, the artery is enlarged, and the walls of the artery become weakened. There is a risk of life threatening bleeding if the aneurysm bursts. It is recommended that you do not eat for 8 to 12 hours before having an abdominal ultrasound. Fluids and food can make it difficult to get a clear picture of your aorta. We ask that you inform our office of any medications you are taking. Dr. Maddahi will provide advice on continuing these medications and whether you should drink fluids during your fast. Your abdominal aorta ultrasound test at our Los Angeles office will take approximately 30 minutes to complete. During the test, you will lie flat, and a bit of gel is placed on your abdomen. This gel helps to keep contact between your abdomen and the transducer. The transducer is a handheld wand that the technician uses to take pictures of your aorta. Your images are recorded and analyzed by Dr. Maddahi. If any abnormalities are found in the abdominal aorta ultrasound, Dr. Maddahi will prepare a plan determining your best treatment options. The abdominal aorta ultrasound test is just one of the ways Dr. Maddahi continues working in the prevention of heart disease, and the restoration of healthy hearts. He has successfully treated thousands of heart patients. Call our Los Angeles office at 310-824-4991 or click here to schedule your abdominal aorta ultrasound with Dr. Maddahi today!